The votes in the Washington state Legislature capped a frenetic 60 days that many lauded for the accomplishments — and others questioned because of the rushed, secretive or creative maneuvers state lawmakers employed. OLYMPIA — A onetime state property-tax cut. Court-ordered schools funding. A surprise deal to change Washington’s deadly force statute for law enforcement. As they wrapped up their 2018 legislative session late Thursday night, Washington lawmakers passed that trifecta of proposals. The votes capped a frenetic 60 days that many lauded for the accomplishments — and others questioned because of the rushed, secretive or creative maneuvers lawmakers employed to push legislation through. Fueled by a roaring economy that boosted state revenue projections, lawmakers passed a supplemental operating budget package that cuts statewide property taxes by $391 million, or 30 cents per $1,000 assessed value, next year. 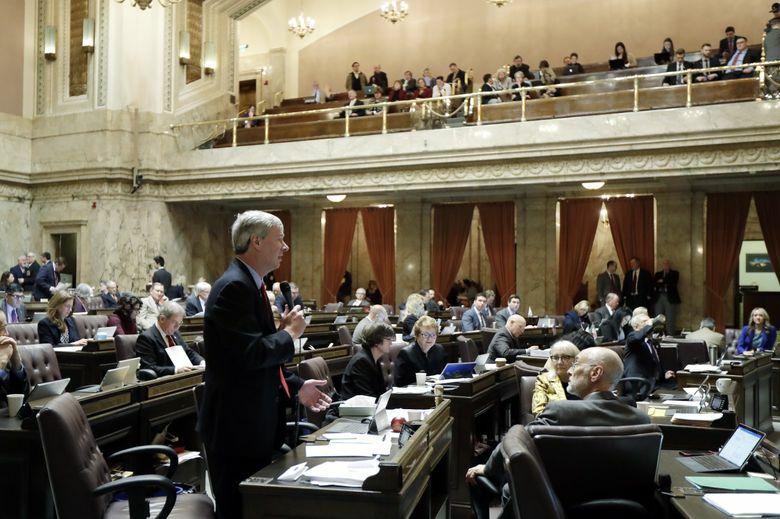 The budget also marks what lawmakers hope is the final major installment of the state Supreme Court’s 2012 school-funding order known as the McCleary decision. It provides $776 million for teacher salaries to satisfy the court’s most recent ruling — and finally budgeted for the court’s long-running $100,000 daily contempt sanction. Legislators earmarked $105 million for the fines, which ultimately will go toward education funding. Lawmakers, meanwhile, finished a deal to change the law that makes it almost impossible to charge a law-enforcement officer found to have wrongfully killed someone in the line of duty. Announced just days earlier, the compromise brought together community advocates who had successfully gathered signatures for deadly force Initiative 940 and law-enforcement groups that had largely opposed changes to the law. But lawmakers and Inslee didn’t get everything they wanted this year. A long-sought bill to repeal the death penalty passed the Senate but stopped in the House. Despite movement for a major climate-change bill, Inslee’s carbon tax never got a vote in the House or Senate. The renewed interest in gun regulations after last month’s Parkland, Florida, school shooting wasn’t enough to push forward a bill that would raise to 21 the minimum age required to purchase a semi-automatic rifle. As lawmakers pondered this week’s police deadly force compromise, Senate Republicans questioned whether immediately changing an initiative was constitutional. Usually, an initiative like I-940 goes to the Legislature, where lawmakers can pass it, or reject it and let the initiative go to the ballot. Or, lawmakers could pass an alternate proposal, which would send both initiatives to the ballot. Among other things, the compromise removes a “malice” requirement to charge an officer and orders new de-escalation and mental-health training for officers. Under the deal, lawmakers passed I-940 and also passed a separate bill to alter the initiative with the agreed-upon language. “Never been done before,” said Rep. Roger Goodman, D-Kirkland, one of the lawmakers who struck the deal. That wasn’t the only creative, last-minute maneuver that lawmakers used this year. In their tax-cut plan, Democrats transferred to a separate account money bound for the state’s rainy-day fund, angering Republicans who called the move unconstitutional. “It’s a mechanism only Bernie Madoff could love,” said Rep. Jim Walsh, R-Aberdeen, in a speech opposing the tax-cut bill. The tactic allowed Democrats to skirt the 60 percent vote threshold to dip into those budget reserves, which would have required Republican support. That move came just a week after a bill was sponsored by legislative leaders that would have exempted lawmakers from Washington’s voter-approved Public Records Act. Lawmakers announced and passed Senate Bill 6617 within 48 hours, without public hearings or floor debate. After 20,000 people contacted Inslee’s office to protest the move, the governor vetoed it. In a floor speech, Sen. Michael Baumgartner, R-Spokane, said that it had “not been a great year for process and procedure” at the Legislature. “That is the only thing that separates our government from other forms of government,” Baumgartner said as he spoke against how the deadly force initiative was being passed. The criticism did not deter Democrats, who pointed to the reserves still remaining in the budget, and who called the deadly force legislation urgent and necessary. In what at times looked like a frenzy of lawmaking, legislators approved a slew of bills over the past months, including many that had stalled in previous years. In January, they struck a deal ending a stalemate between Democrats and Republicans that last year had stalled a $4.2 billion capital-construction budget and a bill regulating rural water use. Both bills passed. Democrats, who now control both the House and Senate, got Republican support to pass bills to ban bump-stock devices for guns and to bar people convicted of domestic abuse from possessing firearms. Lawmakers voted to outlaw housing bias based on a tenant’s source of income and approved a trio of bills aimed at curtailing harassment in private workplaces. They passed a state Voting Rights Act and a bill to address to gender pay inequity. Many of those bills had been touted as priorities ever since Democrats retook the Senate last fall. Other Democratic priorities came on the sly. Even before their public-records overhaul was vetoed, Democratic lawmakers quietly tried to pass two other bills to roll back other parts of the Public Records Act. Those bills ultimately died. And Democratic lawmakers passed on a party-line vote a bill that restructures how the state contracts with tens of thousands of home health care workers — and could lead to thousands of those workers paying union dues. The bill drew fierce opposition from conservatives. In protest, all 48 House Republicans refused to vote on the measure. It’s now on Inslee’s desk awaiting his signature.